My faithful V-Strom was replaced by the first new baby, an almost new Super Ténéré that I enjoyed for a few months here and there before it was stolen right from my front door. 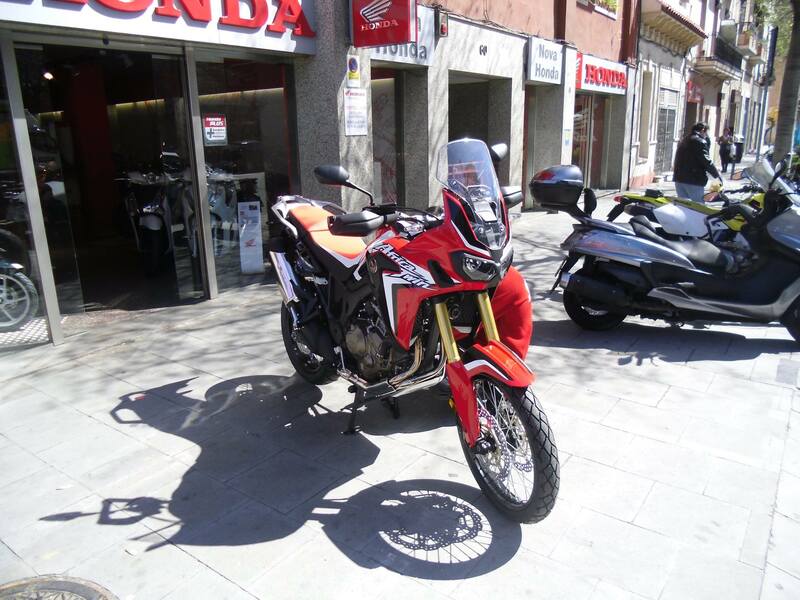 Fortunately, the insurance company paid a decent compensation and I was left with two choices – try to find another good deal on a second-hand Super or wait and save money until the new Africa Twin was on sale. I so wait I did until I could get a test ride on the new AT, which I happened in early February. The bike was amazing, and the decision was made. Fast forward to Wednesday, last week. 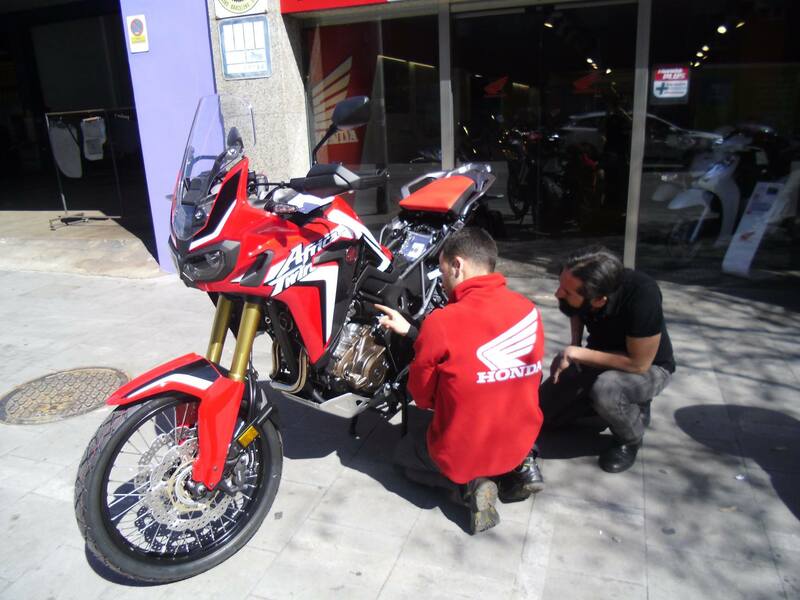 Having saved enough for the new AT, I had made enquiries at a few Honda dealers in Barcelona, but they were all aware of the high demand there was for the bike and everyone was asking list price for it. Then a good friend from Sant Just texted me to say that he had dropped by his local dealer and had a very tempting offer in black on white. Besides the offer, they also had a Rally red motorbike in stock, which was the only color I had not seen in the metal, so I went to have a look. Ever since the bike had been officially unveiled, I had spent hours looking at pictures of it, imagining what colour I would get, but these things can change a lot when you see the real thing. I thought that the silver model looked a bit bland, and it did when I saw one, unlike the black, which had not really caught my eye in the brochure but had captivated me in the dealer where I took the test ride. The one I actually rode was the one in the classic Honda tri-colour paint scheme, and that was the one I, like many others, had a crush on. However, now the moment had come to make a decision and order one, I found it a bit too fussy, even more so if I was going to fit it with crash bars, metal panniers and other stuff, so I was practically sold on a matte black one. Or so I thought… when I walked into the dealer and saw the red one, I fell in love. It looked way better than in the pictures – not so much going on at the same time as in the tri-colour, but not as dark as the black one. It was elegant enough to drive to work every day and sporty enough to look in its element blasting down a dirt road. Perfect. Any last minute thoughts on the tri-colour were blown away when I learned that the expected delivery dates were around October, and I put down a payment on the red one. I use the bike to commute every day, and I did not want to run the new one in like that, so we agreed that I would pick her up on Friday the following week to take her for a long ride on the weekend and have her serviced once I came back before putting her to her daily duties. Why wait a week and a half? you may ask. Why not just do it the following weekend? Because it was Nat’s birthday on Saturday, and we were having lunch with some friends. They did call me on Friday to say that if I wanted, I could pick the bike up on Saturday, and my friends could not believe that I would not, at least, take her home until the following weekend. 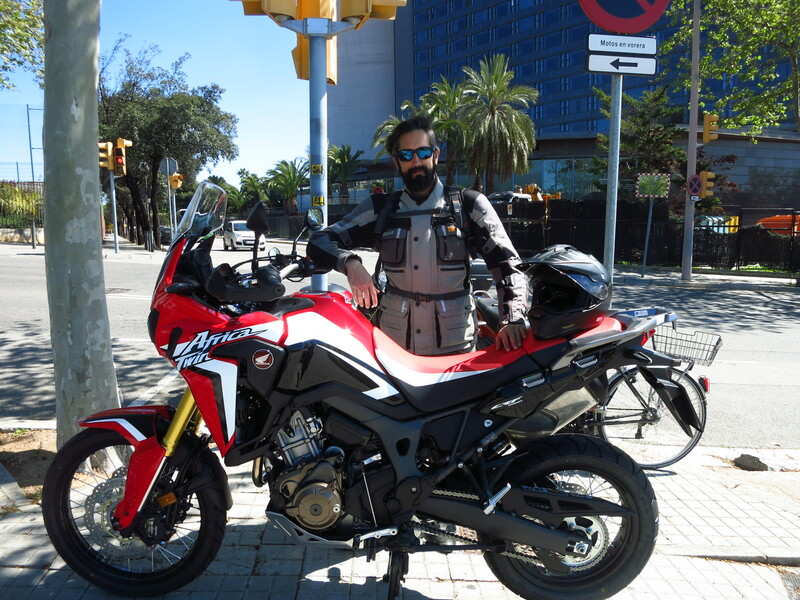 The reason I didn’t is very simple – I knew that if I went to the dealer and got on that bike, by lunchtime I would already be 500km away from Barcelona… So I patiently waited until I had a free morning… today! After a thorough explanation of all the controls of the bike and booking the first service for next week, the new baby is finally tucked away in the car park, waiting to hit the road on Saturday morning. We will take three days to ride a combination of motorway and back roads and make sure the bike is properly run in. A longer post will follow when we come back. In the meantime, here are the very first pictures! This entry was posted in Equipment and tagged Africa Twin, Honda CRF 1000 l by Kilian. Bookmark the permalink. Thanks! The shaft drive was certainly a plus in the Ténéré, I enjoyed travelling without having to bother to check/grease the chain, but it would have made the AT heavier and eliminate the possibility to change ratios for more technical terrain. I might try on of those automatic chain oilers – Scottoiler or PDoiler, any recommendations from users?